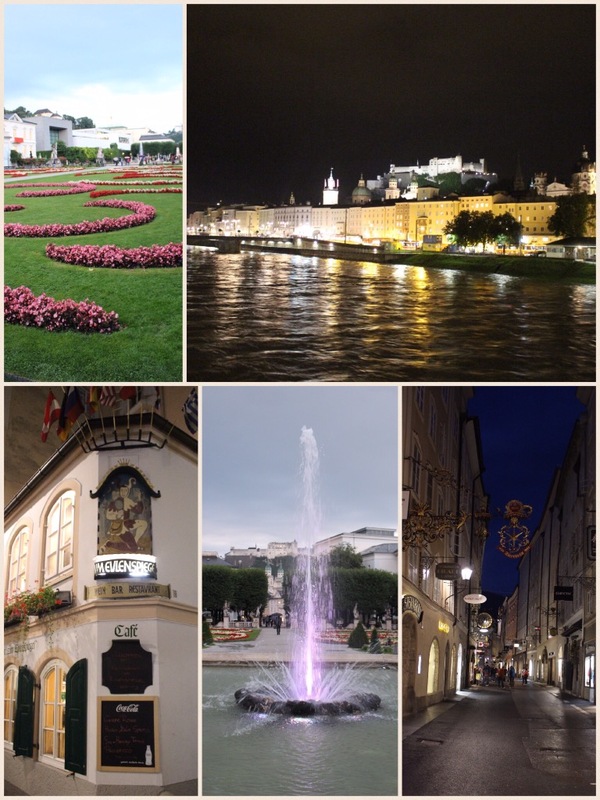 Location: Salzburg A. Our friend’s friend’s field behind their house! Weather: grey and wet boo! Bluebell the motorhome is parked up behind our friend Ian’s family friend Bruna’s house on the outskirts of Salzburg. Ian is one of Keith’s oldest friends, who lives in Croydon so it’s a bit surreal meeting up here! Today began wet, again, but we decided enough was enough, we were going to visit the Eagles Nest regardless. I’d read lots of blogs about people taking their motorhomes up to the parking lot in Obersalzburg, so pointed Bluebell’s wheels in that direction and off we tootled. There is a hill for around 4Km up to the parking lot – 3 of which we managed, albeit in first gear. Bluebell decided three was plenty, and decided to get stuck, wheels spinning, steam whizzing out of the bonnet, with around 15 cars behind us! We quickly put our hazards on, motioned for the cars to pass, and then proceeded to REVERSE back about 200m to find a wider stretch of road, round a blind bend, you get the gist, where I was able to do a three point turn, thank goodness no traffic came at that time! And roll gently back down to Bertesgaden where we found a large carpark by the station and a bus with more power than us, to take us up to the parking area. I’m not sure why, it may have been the increased sweat on my brow from the encounter up the hill, or the fact that we gave him a €20 note, but the bus driver allowed us on without a ticket! Either way, we were soon in the correct place, sans motorhome ready to get tickets up a further hill (accessed only by their special buses) to the top of the Eagles nest. I was not amused to see several motorhomes up in the car park, I have no idea why they got up but not me, I felt a bit of a failure although Keith kept telling me that the ground was too wet and maybe they accessed on a different route! The journey from the parking area to the summit was spectacular even though we had rubbish weather. At times the road was a steep drop down on each side- I’m not surprised they don’t allow traffic up there! We saw Lake Konigsee which was gorgeous from above. Once up at the Nest we had an hour or so to look around, the weather cleared up just at the right minute, and we were treated to a fabulous panoramic view. 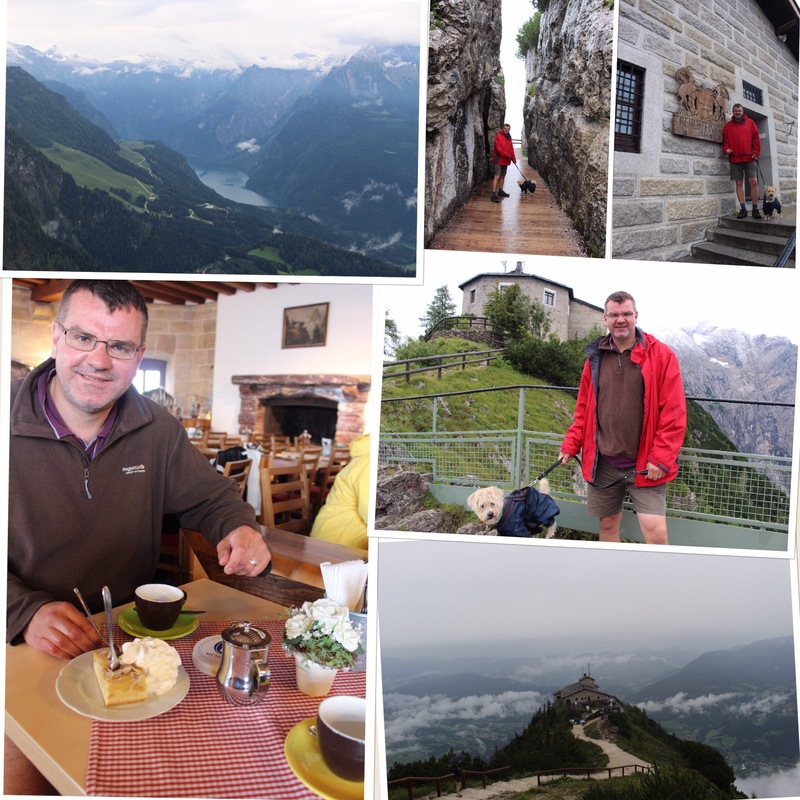 There was an eery feel up there for sure, even Jazz wouldn’t settle when we stopped for a coffee and apple strudel in the living room- now a restaurant. When we returned to the parking lot we realised the next bus down wasn’t for over an hour, so we called a cab which took us down for the mere sum of €15. Considering it should have been €8 each way and we got a free ride up we were happy to pay this. 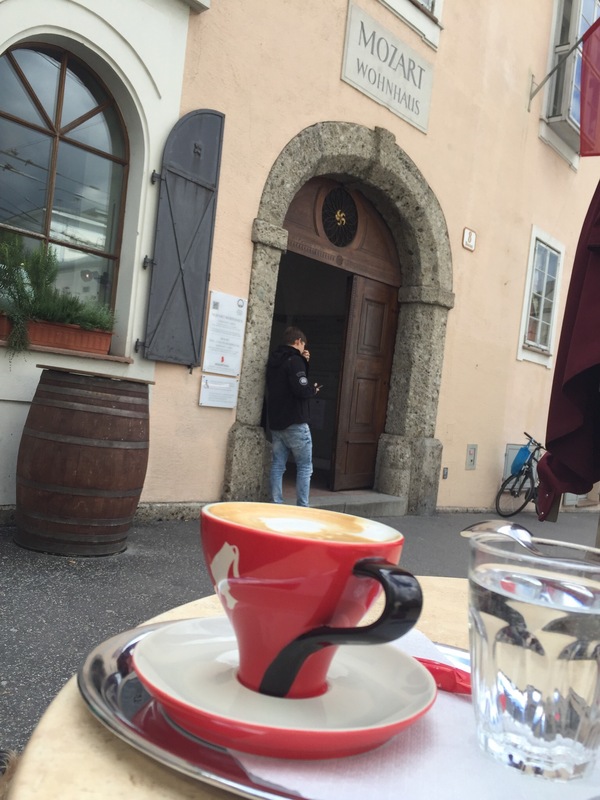 It was time to hit the road, the short distance to Salzburg. Sadly we got stuck in the most horrendous traffic jam, it took us over 2 hours to travel 15 miles! By the time we reached Ian and Bruna we were glad of the afternoon tea she had kindly laid on for us! Bruna insisted on cooking our evening meal, a delicious Spag Bol after which Ian drove us into Salzburg for an evenings wander/beverage. Today began with a wonderful cooked Bavarian breakfast, thanks Bruna, before we headed into Salzburg. Ian took his car, and we took Bluebell the motorhome as he was picking up more friends who were arriving today. We parked in the park and ride at Messe and he drove us into the centre. 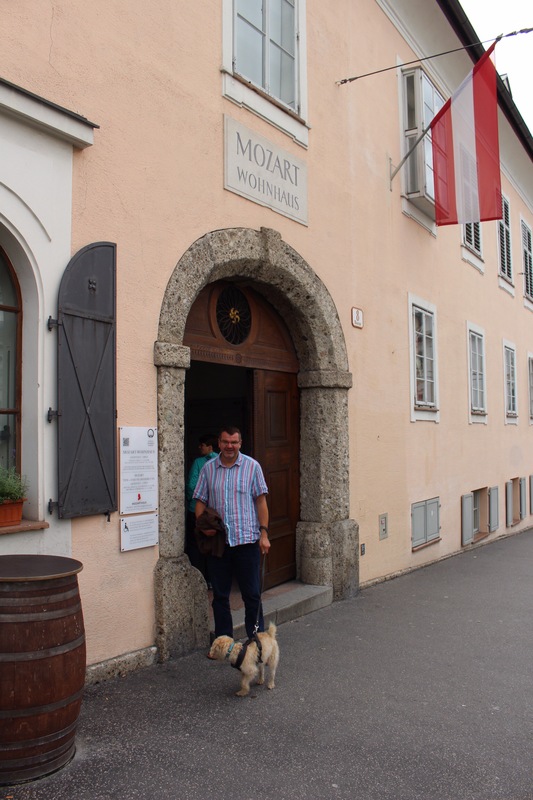 Our first visit of the day was to Mozart’s house in Salzburg, where we saw Mozart’s piano and violin. I can’t decried how incredibly cool this was to see, not to mention massively overwhelming for us as musicians and Mozart fans. I’m not going to lie, I had a few tears and I know Keith did too especially when he saw the original sheet music to Mass In C Minor, one of his favourites. 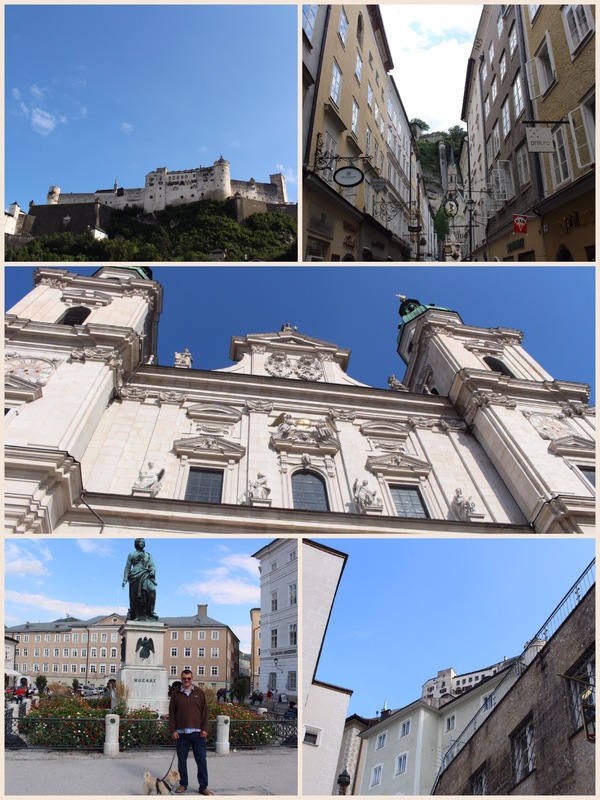 After a quick lunch of Beef goulash, we went on to Mozart’s birth house, and then had a lovely wander around the streets of Salzburg. By now, the weather had cleared up- so it was really lovely taking in some of the sights. 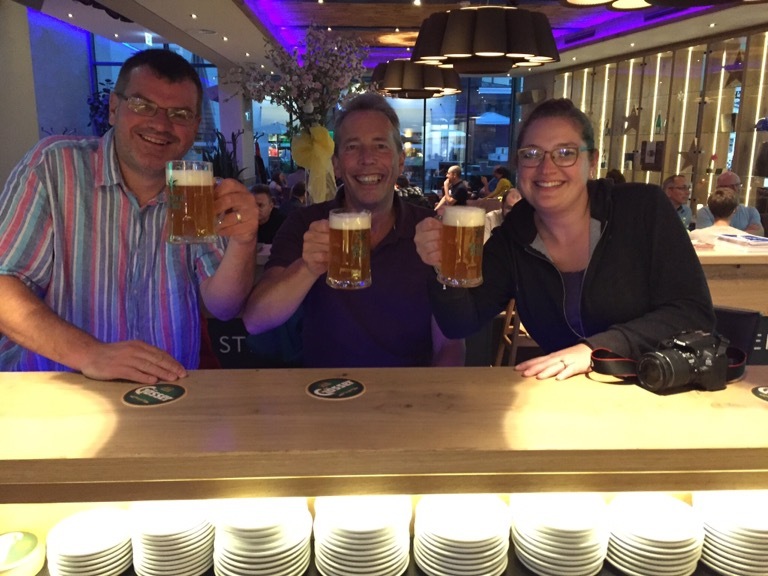 We returned back to Bruna’s in time for a traditional Schnitzel meal, which was scrummy, before watching some of the Salzburg scenes of the Sound of Music, ready for tomorrow! I went to bed doing the sunshine dance, I think the weather gods got lost in translation though as we woke up to MORE RAIN! Either that or they couldn’t work out my expert(!) dance moves! There surely can’t be much more left in the clouds! 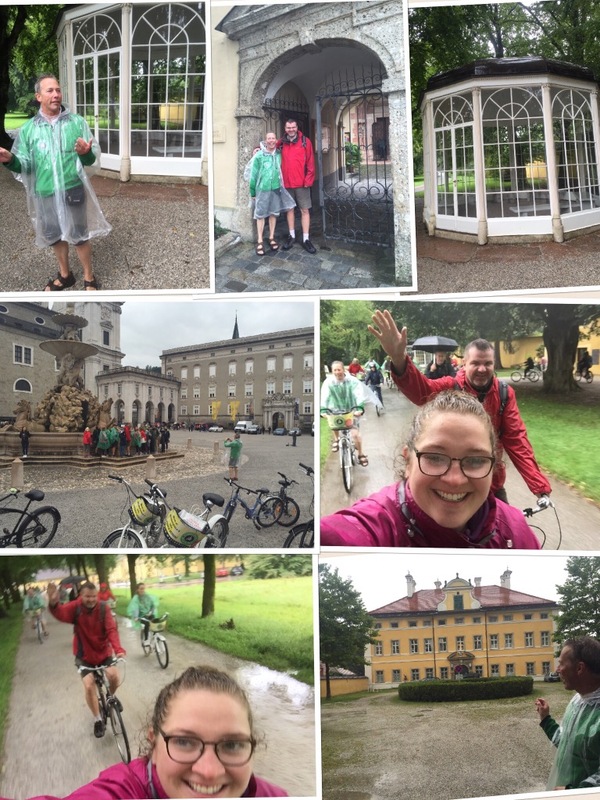 Never mind, we had an exciting day planned, we were back into Salzburg and booked onto a 09:30 tour with Maria’s Bicycle tours and our friend Ian was our guide for the day! Ian is the biggest Sound of Music Fan in the world, he bagged this cool summer job of his having taken the tour himself, and pointing out extra bits of info, at the end of the tour the manager offered him a job! The tour left Mirabell gardens at 09:30 in the driving rain, with us all singing “Let’s start at the very beginning…!” and throughout the following 4 hours we visited location after location from the movie including the Abbey, the Von Trapp House, the lake, the gazebo- many of these spread out in such a distance they were only reachable via bike or car, some were even not manageable for cars. My favourite part was out of the city when Ian got his soundtrack blaring out and we all were riding along in the rain getting soaked singing at the top of our voices! Keith and I know what a huge fan of the film Ian is but it was so wonderful to watch Ian pass on his enthusiasm despite the rain to others who don’t know him and watch them get drawn into it all. 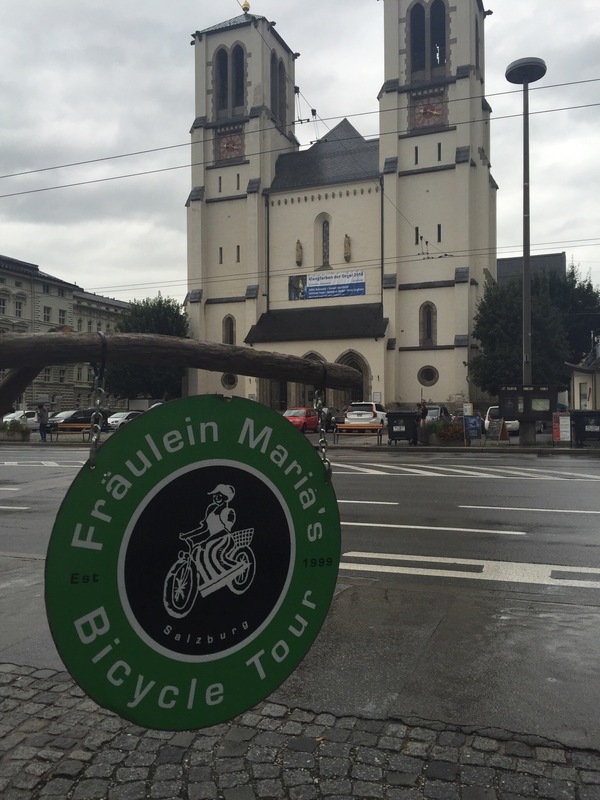 The tour costs €30 each and includes bike hire. We took our own bikes so Jazz could come along too. 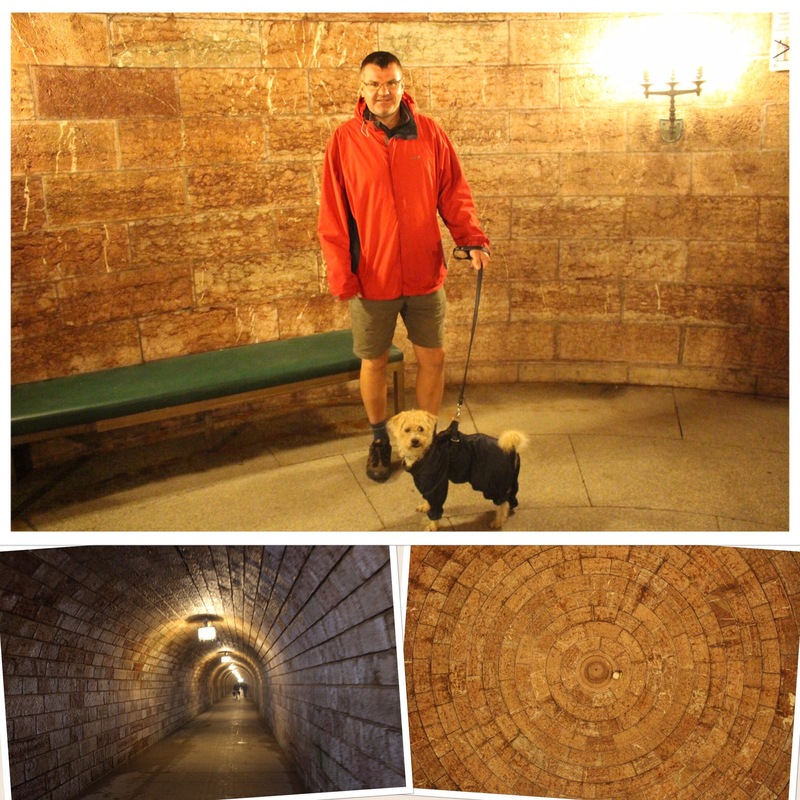 Keith isn’t the biggest SofM fan out there but he really enjoyed it, feeling satisfied that he had seen some historical parts of the city we hadn’t seen previously. The other 15 on our tour all looked happy, if not soggy as we all were! 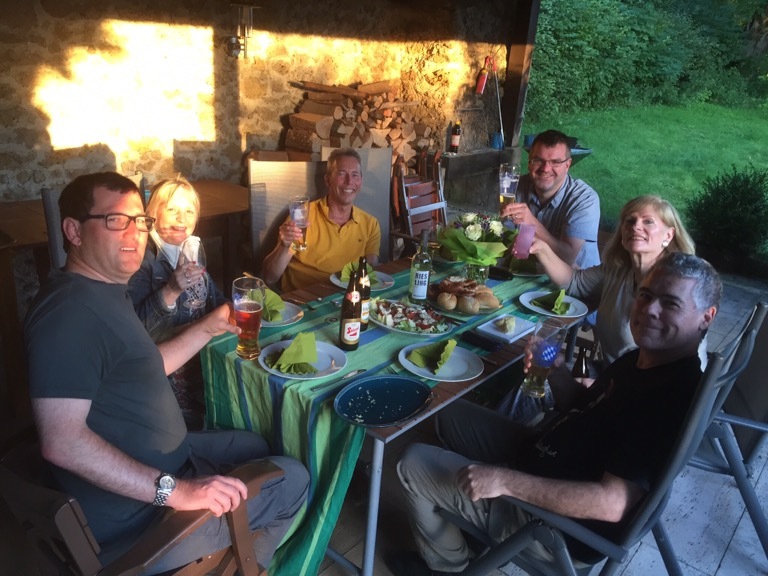 Once back at Bluebell we decided to crack on to Vienna and try out getting a vignette for the motorhome so we could travel on the main motorway, reducing our journey time by 3.5 hours. I was under the impression that this would be a challenge, but actually it was simple, I’m assuming cos we are under 3.5 tons. All we did was pop into the petrol station where we filled up (€0.97!) and ask for a 10 day pass. We handed over €8 and off we went. 3.5 hours later we pulled into the main aire in the city, where there are spaces for 188 motorhomes, to be greeted with a “sorry we are full, you need to pre book!”- now this is new to us, booking space on an aire. 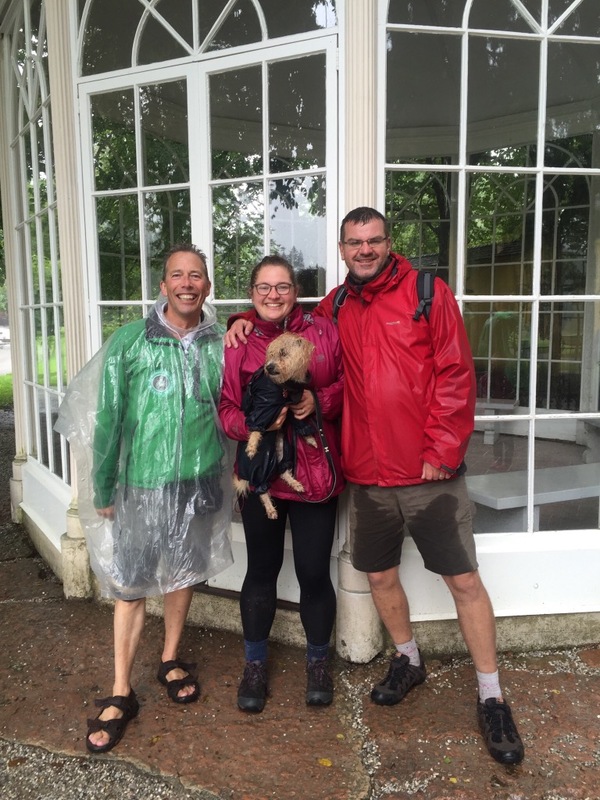 After a grumble, and nearly some tears from me, I was shattered, he gave us a sheet with a nearby campsite address on and told us he heard they had space, 3 hours previously! Off we drove on the longest 10 minute journey known to man, and hurrah, we got onto the campsite. Reception had shut and a note was attached “find a space and it’s yours, check in tomorrow morning”. 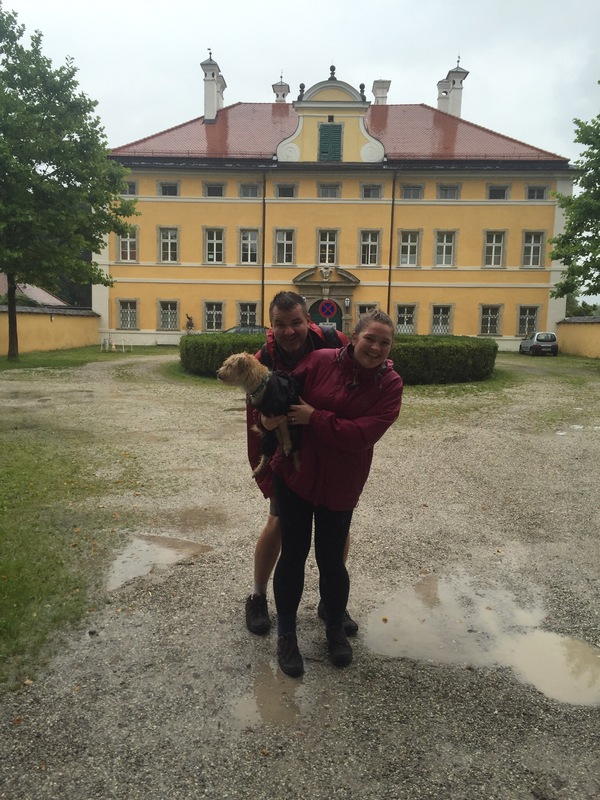 Perfect, we found a space on a luxury pitch with water, electric and grey waste disposal, so decided to blow the budget and book on for 3 nights, in order to regroup and explore Vienna.